Inventory We are a resale marketplace, not a box office or venue. Ticket prices may exceed face value. This site is not owned by Davies Symphony Hall . 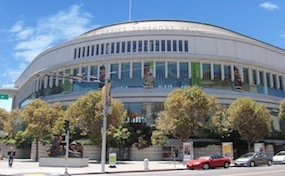 The Louise M. Davies Symphony Hall in San Francisco California was completed in 1980 after two years of construction. The 2,743 capacity venue cost $28 Million to complete and is the primary home of the San Francisco Symphony. The acoustics of the venue were sub-par after construction and required a $10 Million improvement to yield the results the symphony was looking for. The modifications to the inside architecture of the hall also added more grandeur and ambiance for the audience and performers. The adjoining building is comprised of three rehearsal stages, both a recreation and locker room for performers, and a full sized employee parking lot. SymphonyHallSanFrancisco.com is an independently owned and operated company that specializes in all online resale tickets in the resale secondary market. We are not currently affiliated with any official box office, website, and or venue. Ticket prices on our sites may be well below or above face value and can change quickly with market conditions. To order tickets to all Davies Symphony Hall San Francisco events please follow the steps online through the checkout or call our operators for further assistance.